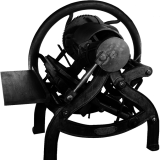 Mark Barbour is the Founding Curator and Executive Director of the Int’l Printing Museum, Carson, CA, established in 1988 to house one of the largest collections of working antique printing presses in the world. Mark is actively involved in researching printing history, writing hundreds of articles on the subject, giving presentations throughout the year, developing educational programs that reach 20,000+ students and visitors annually, and acquiring machines and artifacts for the Printing Museum’s growing collections. Mark is also an active letterpress printer, calligrapher, and collector of books on printing and typography.